Books, webinars, conferences and networking — with hefty discounts. Starting from $3 a month (yearly payments?). You can cancel any time. Let's get it just right! We'd be happy to provide custom plans for students, companies and everybody else! Whatever you need — just how you need it. Just want to support Smashing? That's your option! Become a Supporter$3 / mo. Current Plan: Supporter $3 / mo. A perfect package for independent designers and developers. Become a Member$5 / mo. Current Plan: Member $5 / mo. Great for agencies and organizations that care about being up-to-date. Become a Smashing$9 / mo. Current Plan: Smashing $9 / mo. Follow @smashingmembers on Twitter for updates on schedules, transcripts, new eBooks and other lovely things. With the Membership, there is a goldfish to catch every month. with Vadim Makeev, Vitaly Friedman. Even minor support matters. Choose the option that works best for you. You can cancel any time. No buts or ifs. CSS Grid by Rachel Andrew, Debugging by Remy Sharp, CodePen, Shopify, Mailchimp etc. We believe in an open, diverse and accessible web. With your help, we want to reward people doing great work to make it happen. That’s why we actively support community events and projects, and people behind them. We want to keep things fully transparent, so here we’ll be reporting how we spend the money. ran webinars on Internationalisation, Machine Learning, Designing with Ethics, State of the Web in South-East Asia, Designing with Ethics and Collecting User Data without Compromising Privacy. Members have free access to all the recordings. and we had our first anniversary! It’s all made possible with your contributions. You made it happen. So thank you. support web-related non-profit events and meetups. we’ll continue to be fabulous and groovy. Your support allows us to bring you great content, pay all our contributors fairly, and reduce advertising on the site. Thank you. 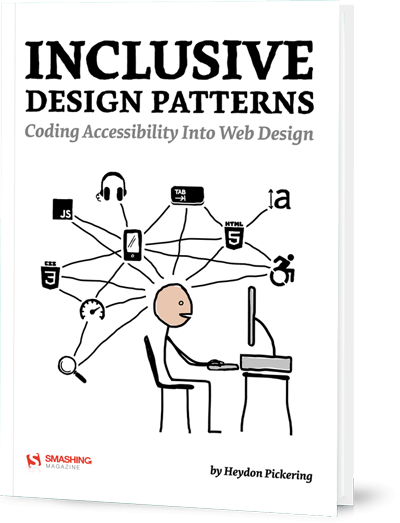 We also publicly released Inclusive Design Patterns, by Heydon Pickering, for free. bookmark the site and keep reading it every now and again. Thanks for getting so far, and hopefully see you in some part of the world soon! Boooo-yah!